”At present women are making big strides in every field; their names are shinning bright in different areas. If they make up their mind to do something revolutionary, absolutely nothing can stop them from making it possible. However, due to water crisis in Maan taluka, women here have been facing tremendous issues. Thus, it’s time that all women out there become leaders and move ahead to change the situation. For this, it is necessary that we participate by taking initiatives”, Dr. Bharati Pol, member of Zilla Parishad. On 30th August 2018, in Dahiwadi at Dangre Mangal Office, a women’s water rally was organised; attended by women from selected six villages. This was the very first water-related gathering for women from Maan village. The main agenda of this meeting was to create awareness and consciously propagate importance of women leadership to drive change by taking participatory grassroots ownership, activating women’s involvement in the process of public-centric water, increasing women’s initiatives and participation in the next micro planning in the water process and strengthening support and solidarity between CORO, Government, village and other organizations / organizations. The women’s water rally was started by name registration. The women who got their names registered were welcomed and they were given gajra and breakfast. Madhuri Bhosale, was anchoring the program. Before the program commenced, social songs were sung and games were played for women’s entertainment.Later, the guests arrived and the actual program started. The guests were welcomed; the guests and organizers payed tribute to Savitribai Phule by lighting a candle in front here photo. The introductory speech was made by Vaishali Raite. 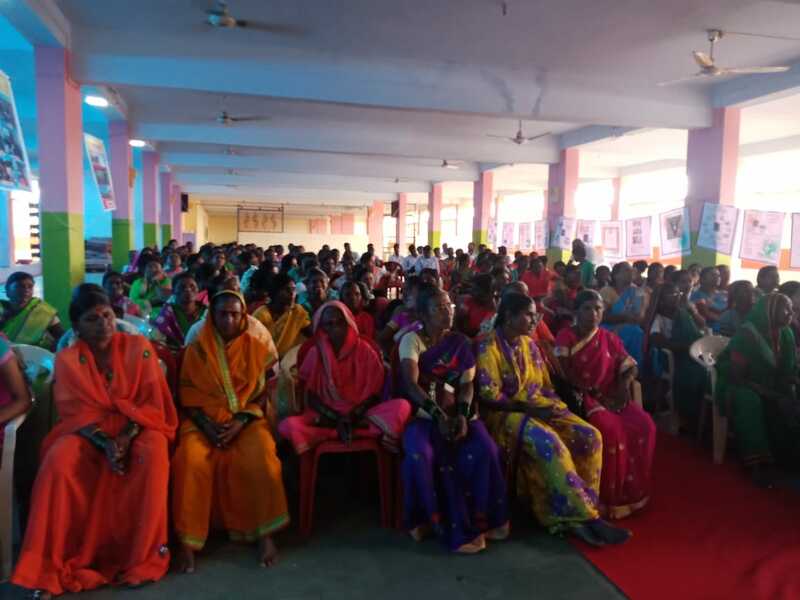 She introduced CORO India, mentioned program’s purpose, format, standard water procedure in Maan taluka and emphasized the importance of strengthening women’s organization as a result of this program. Maan nagar President, Sadhna Gundge spoke about drought, it’s adverse effects on women living conditions and the need for women leadership. The program’s special guide Uma Bhadkar presented CORO India’s story and Acquadam organisation. She further stated that women’s participation in water related initiatives is necessary, while sharing a success story of Rasulabad village. Bharati Pol spoke about Maan’s water situation and the gravity of pushing women leadership to another level. She also urged everyone to cooperate with CORO by lending their support to them. The program ended by reading out the crux of Indian Constitution and later by singing a song on equality and vote of thanks was given by Karishma Jadhav. The primary efforts were made to build women’s union by bringing women from six villages together. Apart from this, the participation of women from the village, CORO, Government and other organizations was strengthened. Also, by calling people’s representative program for the program, 10% funds implementation was spoken about and for the same, Dr. Pol said that she will be getting required support. The number of women from the six villages was approx. 250. Selection of women the villages helped them to increase their active participation and initiative. Also, everyone realized why it is necessary for women to actively participate in the water process, initiatives and decision making in action programs. Apart from this, women got an opportunity to showcase their skills and art forms by singing songs on the stage and interact with other women. Addressing Water Scarcity with People Initiative (AWSPI) is one of our regional campaigns, in Western Maharashtra. This campaign focuses on mobilizing people in villages to secure their rights and secure water resources by advocating for government schemes while keeping issues of women’s and children’s rights to the fore. Through this initiative we focus on foregrounding gender and women empowerment as girls and women bear the burnt of water shortages the most.